The company has often said its output would be 300 million tonnes more than the current figure of about 475 million given enough rail tracks to carry the fuel from new and remote mines. Insufficient connectivity is one of the reasons the company has lagged output targets for more than six straight years – leading to shortages at power producers and crippling outages. Speaking on the sidelines of a coal conference in the resort state of Goa, Sood said the company was seeking a joint venture partner to set up the plant. via Coal India plans to set up power plant in 2015/16 | Reuters. The expected production jump will help India keep a lid on imports of coal, which have surged in recent years due to regulatory, environmental and land acquisition delays in starting new mines at home. Mahanadi Coalfields, a Coal India unit with operations in the eastern state of Odisha, expects output to rise to 135 million tonnes next fiscal year from about 114 million this year, Director Of Operations A.K. Tiwari told Reuters. via UPDATE 1-Coal India units see double-digit output growth in 2014/15 | Reuters. China plans to cut its dependence on coal as the world’s biggest carbon emitter seeks to clear smog in cities from Beijing to Shanghai. The nation is aiming to get less than 65 percent of its energy from coal this year, according to a government plan released today. Energy use per unit of gross domestic product will decline 3.9 percent from last year, compared with 2013’s target for a 3.7 percent decrease. The plan may help President Xi Jinping’s drive to reduce pollution as environmental deterioration threatens public health and the economy. More than 600 million people were affected by a “globally unprecedented” outbreak of smog in China that started last January and spread across dozens of provinces, the Institute of Public & Environmental Affairs based in Beijing said Jan. 14. China’s coal use accounted for 65.7 percent of its total energy consumption in 2013, the 21st Century Herald newspaper reported Jan. 13, citing an official it didn’t name. via China to Cut Dependence on Coal for Energy as Smog Chokes Cities – Bloomberg. China‘s fight against pollution continues unabated. Hope it is enough to save China (and the world). Reuters: “China unveiled comprehensive new measures to tackle air pollution on Thursday, with plans to slash coal consumption and close polluting mills, factories and smelters, but experts said implementing the bold targets would be a major challenge. 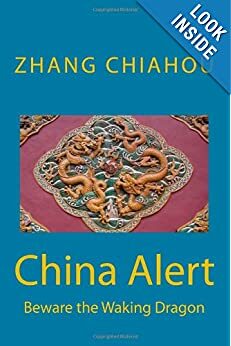 It has also been anxious to head off potential sources of unrest as an increasingly affluent urban population turns against a growth-at-all-costs economic model that has spoiled much of China’s air, water and soil. “The coal consumption reduction targets for key industrial areas are a good sign they are taking air pollution and public health more seriously, but to make those targets happen, the action plan is a bit disappointing and there are loopholes,” said Huang Wei, a campaigner with Greenpeace in Beijing. “We don’t see any fundamental structural changes, and this could be a potential risk in China’s efforts to meet targets to reduce PM 2.5,” said Huang, referring to China’s plan to cut a key indicator of air pollution by 25 percent in Beijing and surrounding provinces by 2017. Coal, which supplies more than three-quarters of China’s total electricity needs, has been identified as one of the main areas it needs to tackle. China would cut total consumption of the fossil fuel to below 65 percent of primary energy use by 2017 under the new plan, down from 66.8 percent last year. Northern Hebei province, China‘s biggest steel-producing region, has announced it would slash coal use by 40 million metric tons over the 2012-2015 period. via China to cut coal use, shut polluters, in bid to clear the air | Reuters. China Daily: “The Beijing municipal government has vowed to slash the capital’s consumption of coal by more than 50 percent over five years based on 2012 levels, according to a clean-air action plan issued on Monday. With the plan, local government is aiming to reduce the proportion of coal used within the city’s total energy mix to below 10 percent. Pollution from coal-fired emissions is a major contributor to Beijing’s smog, especially during the winter. The plan aims to reduce the amount of fine particulate matter to 60 micrograms per cubic meter by 2017, which would be a 25 percent drop from 2012 levels. This requires the capital to slash 13 million metric tons of coal consumption over five years. The municipal government has been cutting down on coal consumption for 14 years, according to China Environmental News, which is run by the Environmental Protection Ministry. 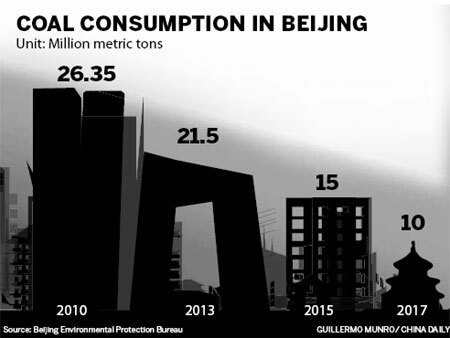 Within that time frame, according to the publication, Beijing has slashed 7 million tons from its total coal consumption. The plan issued on Monday lists a number of coal-cutting measures, including allocating a coal quota to districts and key users, strengthening the capital’s gas and electricity supply and revising a sulfur concentration standard in coal. By reducing its coal consumption, the government says it will increase the demand for natural gas supply to 24 billion cubic meters by 2017, a goal the government said it will meet. “The supply of natural gas within and outside China is promising since more natural gas reserves have recently been discovered,” said Zhou Dadi, vice-chairman of China Energy Research Society. Four gas-based power plants will begin operations in Beijing by 2014. It has been estimated that they will cut the use of coal by about 9.2 million tons. Another measure within the plan calls for replacing low-quality coal usually used in rural and suburban areas with high-quality coal that is low in sulfur content before the 2016 heating season begins. “These areas use about 4 million tons of coal every year, accounting for less than 20 percent of the city’s total consumption. Yet because of the coal’s low quality, the sulfur dioxide generated amounts to more than 70 percent of the total emissions,” said Wang Jian, deputy head of the pollution prevention and control department of the Environmental Protection Ministry. Wang said all low quality coal will be phased out in 2016.
via Beijing aims to slash coal use |Society |chinadaily.com.cn. BusinessWeek: “For years the Chinese have been told that the blinding, sooty haze choking Beijing and other cities is the price of progress. Yet China’s appetite for energy is literally killing its people. A study published in the Proceedings of the National Academy of Sciences, based on data compiled between 1980 and 2000, estimated that pollution caused by burning coal stripped five years from the life expectancy of Chinese in the northern half of the country—a collective loss of 2.5 billion years. A separate study published in December in the Lancet attributed about a million deaths a year in China to air pollution. Although other factors have contributed to the blackening of China’s skies—including millions of cars and motorbikes clogging roads—coal remains the deadliest. 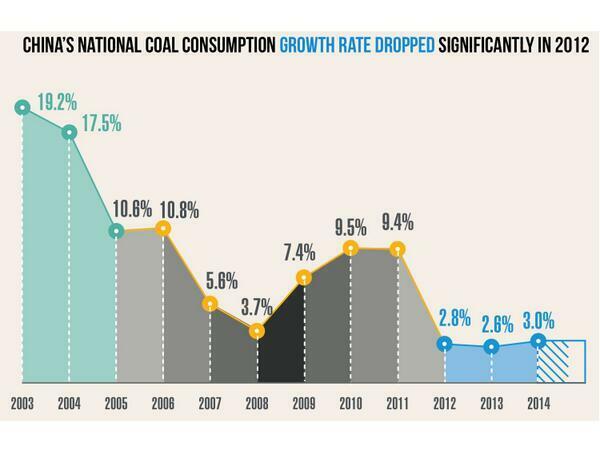 In the past decade, China’s coal consumption has more than doubled. It now burns almost as much coal as the rest of the world combined. In the first three months of the year, levels of PM-10 (particulates with a diameter of 10 micrometers or less) in Beijing were almost 30 percent greater than during the same period a year earlier. By contrast, in the U.S. CO2 emissions hit an 18-year low in 2012. The reason? An explosion in shale gas production raised the share of electricity produced by natural gas from 20 percent to 30 percent, while bringing down the proportion produced by coal from 50 percent to 37 percent. China’s recoverable shale gas reserves are estimated to be 25 trillion cubic meters, 50 percent larger than those of the U.S. The government has already announced subsidies to local shale gas producers; it should also help finance new pipelines and gas-fired power plants. Officials must lower barriers to entry and increase incentives to encourage the most innovative drilling companies—the majority of which are American—to work in China. via Bloomberg View: How Shale Gas Can Save China From Itself – Businessweek. China Daily Mail: “Beijing has vowed to eliminate most coal-fired boilers in the city center by the end of 2015 to reduce pollution from fine particulate matter, especially during the heating season. After reducing coal use by 700,000 metric tons last year, the capital plans to cut another 1.4 million tons this year and use no more than 21.5 million tons, according to the 2013 coal consumption reduction plan released by the city’s Environmental Protection Bureau and Commission of Development and Reform. The capital used 26.35 million tons of coal in 2010, the environmental bureau said. Beijing still has a large number of coal-fired central heating boilers that give off large amounts of coal dust, and noise during the heating season. Richard Saint Cyr, a family medicine doctor at United Family Health in Beijing, said he has noticed an uptick in discussions about the worsening air quality with many patients since winter. He said that air pollution in the past winter was unusually serious and he had never witnessed such collective anxiety in Beijing. via Beijing to shut coal-fired boilers to clean up air |Society |chinadaily.com.cn. As Western organisations know, “what you don’t measure you cannot manage” and “incentives matter”. So China’s local authorities are beginning to realise, as evidenced at Linfen. Assuming this notion is being espoused across China, then it is very good news indeed for the environment. China Daily: “Fan Lifen clearly recalls the days when her hometown was shrouded in darkness, with the sun barely visible through a thick curtain of smog. “The situation would worsen in the winter, when households would burn coal for heating,” recalls Fan, a native of the city of Linfen in North China’s Shanxi province. Rapid industrialization and urbanization in the past two decades have saddled cities like Linfen with heavy environmental burdens, damaging the health of local residents and fueling complaints. However, Linfen is making efforts to turn its situation around. “The air in Linfen has improved tremendously,” said Liu Dashan, spokesman for the Shanxi Provincial Environmental Protection Bureau. The dramatic turnaround started when Linfen was listed as the “most polluted” among 113 major Chinese cities for three consecutive years from 2003 to 2005. 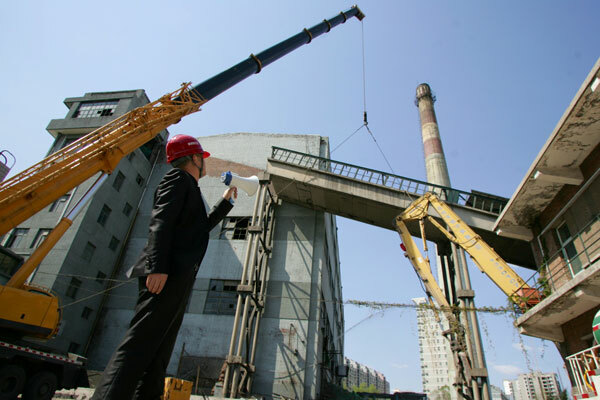 The local government has since launched a cleanup campaign, closing 1,056 factories and imposing stricter environmental standards on those that are still operating, according to Mayor Yue Puyu. Substandard mines have been shut down and smaller ones have been merged into competitive mining conglomerates, Yue said. Residents have been weaned off of coal burning, with natural gas heating introduced to more than 85 percent of the city’s households, said Yang Zhaofen, director of the city’s environmental protection bureau. The changes were made possible by changing the way the performance of local officials is evaluated, with promotions and other rewards linked to their efforts to improve the city’s environment. Officials have not only closed down heavily polluting factories, but also taken action to add “green” features to the city. A large park was opened on the banks of the Fenhe River last year, helping to absorb pollutants and purify the air. 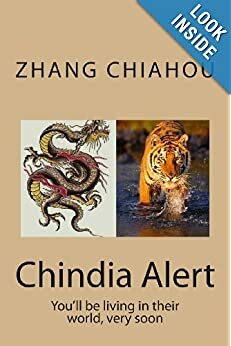 Over the years, China’s economic growth has been fueled by over exploitation of natural resources, resulting in environment degradation. A worsening environment has prompted the government to exert greater efforts on environmental protection, replacing the practice of achieving growth at all costs. Linfen is a part of Shanxi’s efforts to repair its environment. The province, which provides over 70 percent of China’s coal, is slowly turning toward sustainable development. More than 3,000 mines have been shut down since reforms were initiated in 2008, according to Wang Hongying, chief of the institute of macroeconomics under the provincial development and reform commission. In addition to consolidating coal mines, the province has also made changes to the coal tax and fostered substitute industries, Wang said. via China’s ‘most polluted city’ breathes cleaner air |Society |chinadaily.com.cn.